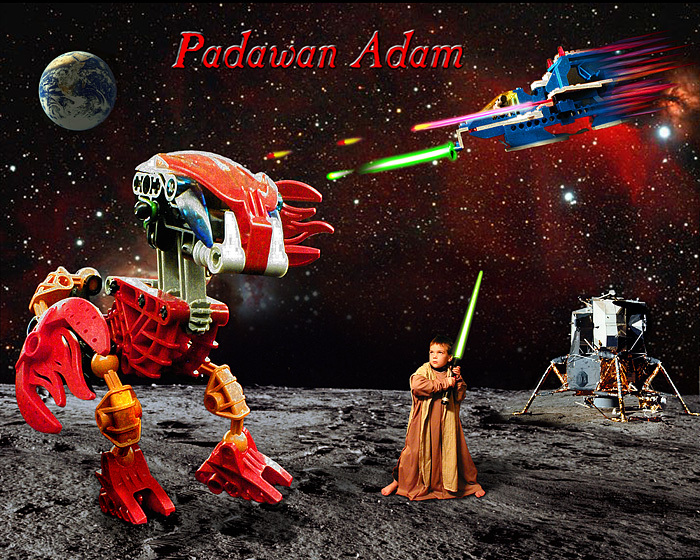 This photograph was created as a result of me trying to explain to my son Adam just how the movie makers of Star Wars create massive ships and odd creatures by using tiny models and computer animation. He was having a difficult time understanding how something really small could be filmed in such a way that it looked really big. An idea popped into my mind to help Adam understand this cinema trickery. I wanted to shoot a simple photo of Adam to make him look small and a toy look big. My wife thought that Adam's shepherd costume he would wear in our church Christmas program might make him look like a young Jedi Knight. The costume looked even better than we imagined. I grabbed our digital camera and Adam's toy light saber and told him to stand like he was going to fight a really big monster. I told him to look up at the dining room light and pretend it was the big bad monster. After a few shots of this pose, he and I took a photo of his Lego ship that we had fun building earlier that day. Adam thought it would be great to include his latest toy, so we snapped a quick digital photo of his Bionacle. He watched how I took every shot. He saw how I got down low and really close-up when I was shooting the Bionacle. He watched closely as I posed his small Pocket Pal dog "Dominic" to use as the pilot of the Lego ship. Together, we spent about seven hours locating images of stars, planets, Lunar Modules, and putting all the digital pieces together in Photoshop. After the lesson was done and the test print popped out of the inkjet printer, he had a much better understanding of how the makers of Star Wars created the huge ships and strange creatures. The finished digital file was sent to my Polaroid Propalette 8000 and a color negative of the file was made. The finished 16x20 will be framed and hung in Adam's room for all his friends to see. Adam will have the opportunity to explain to them the entire process of creating this photograph. This job didn't earn me a dime, but the lessons learned and the time Adam and I spent together planning and shooting was priceless.